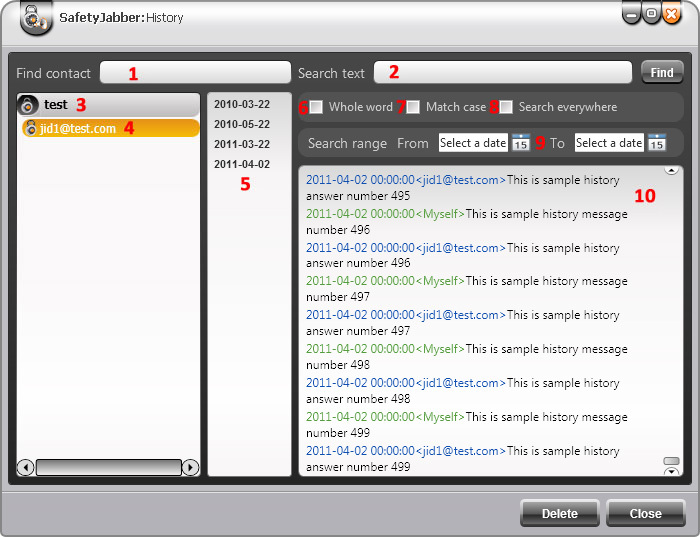 To view message history, click the corresponding point (Picture 1) in the context menu of the necessary contact or the corresponding icon in a chat window. dates, in which the correspondence with the chosen contact took place. 1. Because of usage of encryption algorithms, search and message representation in the history may take a lot of time (from several seconds). That’s why, before you change search parametres, wait for the end of reading and message output and be sure that sought-for text isn’t on the chosen parameters. 2. Also a number of messages in the history have influence upon delay in reading. In case of big delays in reading ,we recommend you to delete unactual files from the history.